END OF BIPARTISANSHIP, AND PERSPECTIVES FOR A LEFT COALITION. The regional elections and the national elections have one common feature in Spain. Finished the hegemony of the right through the two main parties – PP and PSOE. As neither won the absolute majority, they must look for pacts and compromises with the new emerging parties. The latter are generally opposed to the austerity policies imposed by the European Union, and this helps the left because nobody can make a government without them. As these new parties grow, it is interesting to note that the Regionalists and the Independentists lose votes to their right and to their left. As a result of the regional elections in Catalonia (27.9.2015), the government found that it needed to create a working majority, be it with the backers of independence, or with their opponents. After three months of deals and programmatic horse-trading, the President of Catalonia Arturo Mas resigned. Another candidate was elected when the left-wing of the Independentists (CUP) made a pact with “Sovereign road to Independence”. This pact is very fragile, and much depends on the intervention of the workers’ movement. The latter held recently a very large meeting in defence of the right to strike. It was well attended by artists, representatives of various struggles and national trade union leaders. The “nationalists” have declined electorally. In the Basque country, the left-wing Independentists lost 100,000 votes. In Catalonia, the Party of the Catalan bourgeoisie (Convergencia) lost votes; and in both instances, Podemos grew as the main political force. The results of the 15.12.15 national elections opened an even wider political spectrum than in Catalonia. The PP won 123 seats, the PSOE 90, Podemos 69 and the new right wing Party, Ciudadanos 40; Izquierda Unida won 2. Again, neither the right nor the left got enough seats for a governing majority. The more important fact to highlight in those results is that they show the breakdown of bi-partisan politics, and a door opening on the possibility for the left to coalesce with Independentist sectors. The right-wing emerges much weakened from the national elections. There, the PP lost 3.5 million votes, and this loss was not made up by Ciudadanos who got only 40 MPs. As for the left, it displayed a deal of programmatic weakness; this stopped it capitalising on the hated austerity policies imposed by the European Union. This weakens the left’s ability to propose valuable solutions to the crisis. Still in the national elections, the left gained more votes than the right however – even if the Socialist party(PSOE) lost 1.5 million votes. For the latter, this is its worst performance since the start of ‘democracy’. Its leaders could have envisaged a front with Podemos, with the Independentists or with Izquierda Unida. What it produced instead was a lot of diverging declarations from the leaders of different socialist families. The general secretary of the Socialist party nationally, Pedro Sanchez, and his team, appear favourable to a government with Podemos, perhaps even granting concessions to the regionalist parties. In the midst of all this turmoil, Sanchez went to Portugal where he met the left government there. Clearly he wants to do the same in Spain. Against Sanchez however, Felipe Gonzalez plays the bourgeois card. He proposes a PP-Socialist coalition “to give stability to the country and confidence in the markets”. 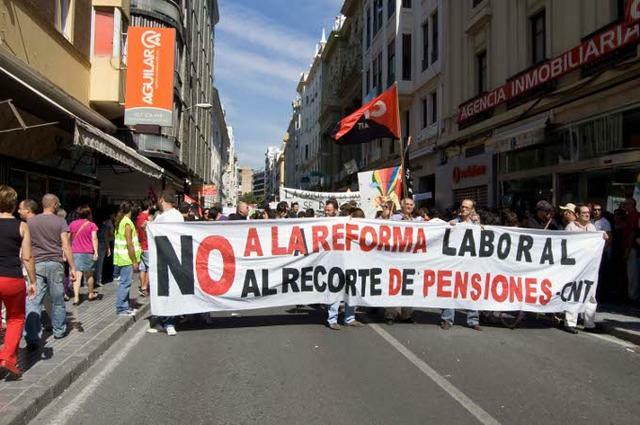 Several PP leaders and the whole of the PSOE’s right wing share this opinion, along with the big bosses and the banks. Podemos got good results despite the difficulties posed by its need for a coherent team, and a partial loss of the support it won in the European elections. This loss is due to the Podemos’ leaders having regressed programmatically. Podemos speaks less and less of Venezuela, it no longer mentions nationalisations, and it has marginalised the issue of the public dept. It has fewer local circles than before, and it intervenes less in the social movements. Its political activity rests essentially on electoral politics. With 900,000 votes, Izquierda Unida has practically disappeared from the political panorama. It has kept good positions on Greece, Syria and the conflicts in the Arab countries. But it made no public announcement about the electoral advance of the right in Venezuela or Argentina. This is all part of the crisis in the communist movement, its incapacity to draw conclusions, its lack of confidence in the intervention of the workers and masses. The trade unions hardly intervened in the national elections, but they organised an important meeting in January, in Madrid, with European trade union representatives. They called to defend the right to strike because the trade union base is pressing for this. It is the trade union base that mobilises in defence of the workers facing the law for having joined pickets in recent strikes. The PP government works away at reforming the Labour Laws. This was the central theme of its electoral campaign. The result is massive sackings without justification, and minimal compensations. The bourgeois class takes care to sack the better paid older workers, to put precarious contracts in their places. A great number of social and trade union activists stood as candidates in the regional election campaigns. Many of them can now be found in the municipalities, the regions and some even in parliament. This weakens the left however, because there are not enough others politically prepared to replace them in the local organisations. These few conclusions show the maturity expressed by the people in the elections. It points to a motion in the direction of social change, despite the lack of a leadership able to set out the perspectives in a conscious and consistent manner. Due to the high level of regional autonomy in Spain, there are also regional parliaments, hence elections. The Catalan regional election took place on 27.9.2015. PP: Partido Popular, has its roots in the People’s Alliance Party formed 9.10.76 by the ex-Francoist Minister Fraga. The PSOE is the Partido Socialista Obrero Espanol, linked to the UGT Trade Union. Examples may perhaps include: the Catalonia “Si que es Pot”, the Canarian Coalition CC, Independentisme Català, EHB Basque, etc. The government of Catalonia, led by Together for Yes. It was then composed of JxSI, CDC, Republican Left of Catalonia, Democrats of Catalonia, left-wing movements and Independentists. This formation was headed by Arthur Mas until Jan 2016. In January 2016, a new election was averted in Catalonia when, at the last minute, “Together for Yes” made an alliance with CUP, allowing a separatist government to be set-up, without Arthur Mas. The CUP is the “Popular Unity Candidacy”. It came 5th in the Catalonia elections. In the national parliamentary elections (15.12.2015), Podemos won 5 million votes, 20% , 69 seats, close to the PSOE. In the Catalonia election, Podemos stood under the banner of Catalonia Yes We Can (CSQP), allied with Catalonia Greens, United and Alternative Left, and Equo. CSQP arrived in 4th place, behind JxSI (1st place), Citizens (C’s) in 2nd place, and Socialist Party of Catalonia in 3rd place. Ciudadanos, a smaller business-friendly Party of the right, supports decentralisation but opposes the right of self-determinatiion for the autonomous communities. This refers to the period that followed Franco’s death in 1975. The constitution of 1978 could be considered as the start of a ‘democracy’ which led Spain into the EU and Nato. Izqierda Unida (IU) is a coalition between the Workers Commissions Trade Union (CCOO), Green, Republican and left parties, and the Communist Party of Spain. IU proposes the end of the monarchy, and withdrawal from Nato.